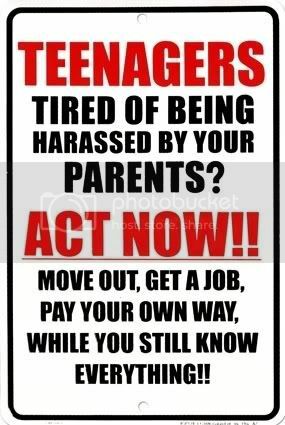 Generally speaking, I believe a parent's legal obligation to provide for their offspring ends at 18 years of age in North Carolina. Last edited by mm34b; 02-04-2008 at 03:02 PM.. When I was a teenager my Mom found a totally funny yet effective sign to hang on my bedroom door. I no longer have it but it went something like this "ATTENTION TEENAGERS! Move out now while you still know everything!" Eighteen - go for it if you need to! Last edited by SunnyKayak; 02-04-2008 at 05:22 PM.. I heard a story about Ethel Kennedy and how she handled her kids when they were being totally impossible and she was having trouble controlling their behavior. One day the kids came home, found all the doors locked and went looking around the house . . . and discovered tents thrown in the back yard. Their mom came outside, told them if they were gonna behave like animals, they could live in the outdoors. She tossed them some toilet paper b/f she went back in. Now there's a strategy . . .
Last edited by Fallingwater79; 02-06-2008 at 02:44 PM..
Is the 18 year old finished with high school? If so, you can kick them out now. Definitely the 20 year old can go. if child is 18 and enrolled in high school in state of maryland...is it legal to kick them out of the house? yes or no?